HOUSTON — Across the country, many public defender’s offices are overwhelmed with cases. But the public defenders in Harris County’s juvenile division are in an unusual situation: They say that they aren’t getting assigned enough cases. And advocates say cronyism between private attorneys and powerful judges is to blame. Norman Lefstein, a professor at Indiana University’s McKinney School of Law, called such caseloads “ridiculous.” He added: “It’s a joke. It’s just a joke … It tells me immediately that you’re not really investigating the cases, and you’re not doing what you need to do ... and young clients especially, they just don’t know any better.” Lefstein is considered a nationwide expert on acceptable caseloads. In a phone interview last week, Sprott told the Tribune that “I devote as much time as I can to each [client.] I don’t know that any are complaining.” He said he has very few paying clients. Fitch and Polland did not return multiple phone calls and emails seeking comment. By contrast, the highest workload last year for a public defender in Harris County was 141 juvenile cases — well below their allowed limit of 200. Juvenile public defenders don’t handle family court cases, and their average salary is $117,500. A state grant helped launch the local public defender’s office in 2011, but it only represents a small fraction of poor defendants in the county; private lawyers handle the rest of the court appointments. 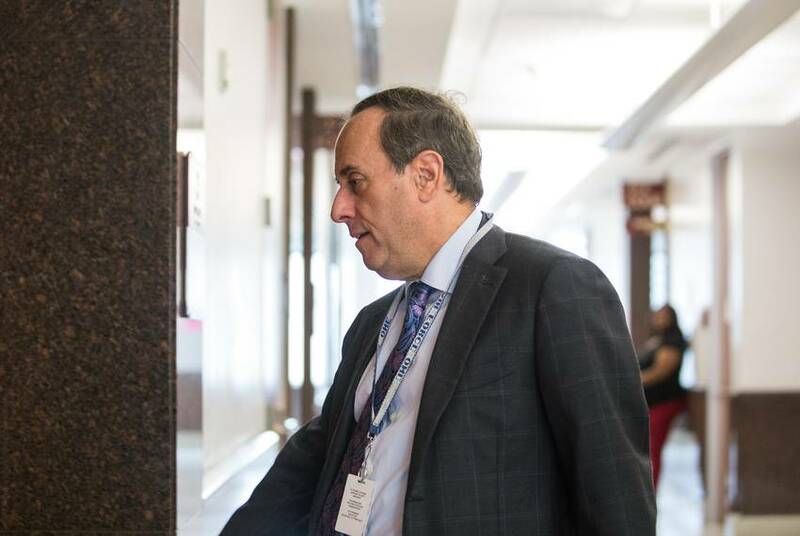 Alex Bunin, chief of the county public defender’s office, said his staff has the capacity — and the budget — to represent more kids if the courts would assign them more cases. “We would love to make juvenile a bigger part of our work, and we’ve been somewhat frustrated that we couldn’t,” Bunin said. The vast majority of juveniles facing charges in Harris County can’t afford to hire a lawyer, so the courts must appoint them one. Attorneys were appointed to more than 5,800 juvenile cases in the county last year; they were hired in fewer than 900 juvenile cases, according to state data. “What we ultimately got was a juvenile system where the lawyers get rich ... and everybody wins but the kids,” Jenkins said. The judges strongly dispute that notion. Schneider said campaign donations have no bearing on court appointments, adding that his court coordinator and other staffers handle the appointments, not him. “I doubt they’re going and looking up who’s making donations, or that they would even care,” he said, adding that he wasn’t aware of the high caseloads for certain lawyers. Sprott agreed: “I would want to think that judges want lawyers that are actually qualified to handle certain categories of cases,” he said. Neither offered explanation of why the county’s seven full-time juvenile public defenders get so much less work than many of the private attorneys. John Phillips, the judge in the 314th juvenile district court, did not respond to multiple requests for comment. He has only received $500 in campaign contributions since 2015, none of it from attorneys, records show. Rodney Ellis, who served 26 years as a Democrat representing Houston in the Texas Senate, said he fought hard to improve the state’s system of legal representation for the poor. But he was unable to change the fact that state law still gives judges the power to appoint attorneys to people who can’t afford one. “That is just an inherent conflict of interest. 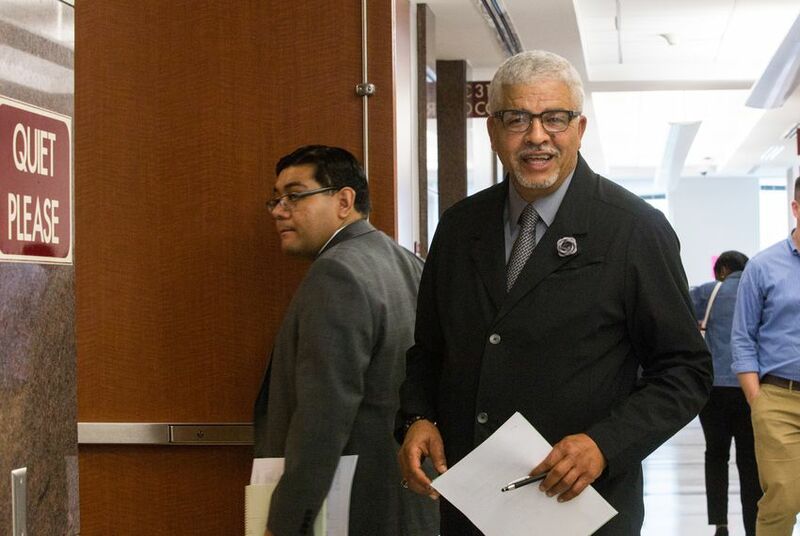 It’s sleazy, it’s old school, and it should have changed a long time ago,” said Ellis, who left the Legislature after being elected as a Harris County commissioner in 2016. The caseload controversy has bled into local politics during this election cycle: Leah Shapiro, who has been a juvenile public defender in Harris County since 2011, is running as a Democrat against Schneider for his seat on the 315th Juvenile Court. Natalia Oakes, a lawyer running as a Democrat against Devlin in Tuesday’s election and who earned about $140,000 from 118 juvenile case appointments and 39 family court appointments last year in Harris County, called the county’s public defenders “hard-working” lawyers. A recent political blow-up between some local elected officials and the public defender’s office might also shed some light on why judges are giving more work to private lawyers than public defenders. The ruckus stemmed partly from some documents that the public defender’s office had sent to Jenkins, the Texas Criminal Justice Coalition lawyer. Jenkins had requested data on some kids charged with aggravated robbery, with the aim of looking into potential racial disparities. Devlin felt differently. In June, the judge told the county’s juvenile board — which oversees the local juvenile probation department — that he had “absolutely no confidence in the public defenders,” and called Bunin a “fat liar.” That same month, the Harris County Commissioner’s Court considered firing Bunin, though they ultimately decided not to vote on the matter. Harris County Judge Ed Emmett, a Republican who is the highest-ranking elected official in the county and who leads the commissioner’s court — he does not have any judicial powers — declined to comment for this story. The county attorney’s office and the board overseeing the public defender’s office both reviewed the issue and have not taken any action "at this time," said First Assistant County Attorney Robert Soard. The county’s district courts administrator, Clay Bowman, offered another reason for the disparity in court appointments. He said the public defender’s juvenile division stopped taking on new cases for a time last year after one attorney went on medical leave, and after that the office asked to be assigned fewer cases. Bunin said the pause only lasted a few weeks, and that appointments to the office had already been declining well before that. Ellis, the county commissioner, said there’s another possible reason that courts would appoint private attorneys to such a large number of cases. Ellis said judges would rather appoint lawyers who will spend as little time on each case as possible. Some lawyers will simply “move the case along [and] convince the person to plea, as opposed to go to trial and find out whether or not they were innocent or guilty,” Ellis said. Some attorneys, though, do appear to spend an enormous amount of time on their cases. So much time, in fact, that it’s difficult to imagine how they could physically work so many hours. Sprott, for instance, billed the county close to $200,000 last year for work outside the courtroom on family court and juvenile cases. Based on the maximum hourly rate the county pays for such work, that comes out to more than 3,000 out-of-court hours; assuming 12-hour work days, the work would have taken about 250 days — close to the entire number of business days that exist in a calendar year. And that doesn’t count time Sprott spent in courtrooms or doing probate court cases. Sprott said that he gets help from a couple of investigators and three or four paralegals, who he shares with six other lawyers. “I guess you’ve got to look at the product that comes out in the end,” he said when asked whether it’s possible to bill for so many out-of-court hours. “This is going to prompt me to do my own query of auditor records and possibly change the reporting requirements for anyone who wants out of court hours,” Schneider added. Sprott was appointed to more than 150 juvenile cases and 29 family court cases in his court last year. "Children come up to me and ask who their attorneys are"
Can a lawyer with such a large caseload do a good job for his or her clients? The Tribune asked the local juvenile probation department for data that would help compare outcomes of juvenile cases for court-appointed private attorneys and juvenile public defenders, but the department told the Tribune that it would cost more than $1000 to compile that data. It’s much easier to get data on how the two groups of lawyers perform in the adult criminal justice system. Back in 2013, experts with a nonpartisan, nonprofit organization called the Council of State Governments Justice Center compared public defenders and court-appointed private attorneys for adults in Harris County. The differences were striking. A small division of the public defender’s office helping adults with mental illness got 27 percent of their misdemeanor charges dismissed. Meanwhile, court-appointed attorneys working with mentally ill clients only got 6 percent of such charges dismissed. 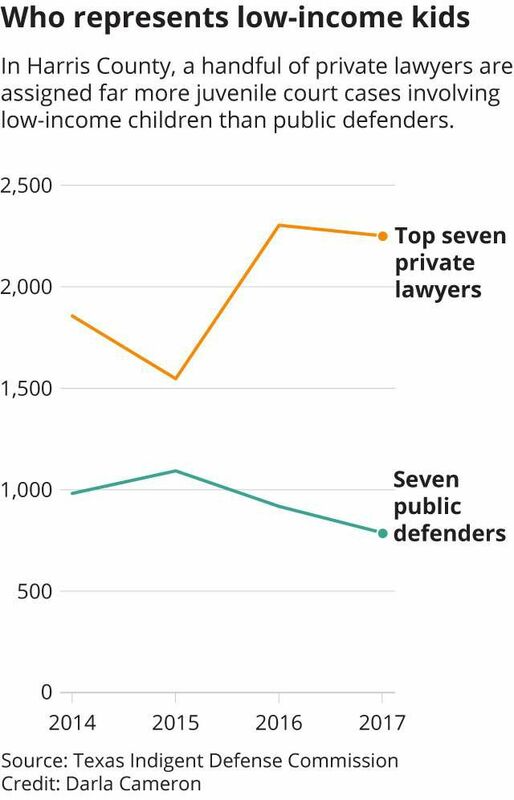 The public defender’s felony trial division also outperformed the court-appointed attorneys. The division’s lawyers got all felony charges dismissed for 17 percent of their clients, compared with 11 percent for the court-appointed attorneys. Meanwhile, 61 percent of the public defender’s clients were convicted of felony charges, compared to 72 percent of court-appointed attorneys’ clients. “Public defender attorneys delivered better defense results” in Harris County, the study’s authors concluded. But they cost the county significantly more money, the study found. The public defender’s office spent about $1,400 per case in both the juvenile and adult courts, while private court-appointed attorneys billed the county an average of $84 for each adult misdemeanor case, $550 for each adult felony, and just $295 for each juvenile case during the study period. Tara Grigg Garlinghouse, an attorney who used to work with the advocacy group Disability Rights Texas, said she regularly hears complaints about court-appointed lawyers in foster care cases. “When I go visit a client, the other children come up to me and ask who their attorneys are, and if they have an attorney,” said Garlinghouse, whose clients are kids and parents involved in the foster care system. Garlinghouse, who recently started a nonprofit called the Foster Care Advocacy Center dedicated to improving legal representation in foster care, said she will limit herself to about 50 cases this year as a solo attorney. She was shocked to hear that many attorneys in Harris County take on upwards of 100 family court cases per year — on top of hundreds more misdemeanor and felony juvenile cases. Gene Wu, a Democratic state representative from Houston who has been influential on child welfare legislation — and has received court appointments as a practicing juvenile attorney — said some of the high caseloads were concerning. “If there are attorneys who are overloaded … then we need to re-evaluate how we do assignments of cases,” Wu said. But he said he thinks the problems aren’t as pervasive as some people make them out to be. “The bulk of the attorneys who are there are doing a great job, especially if [kids] get assigned to the public defender’s office,” Wu said. Schneider, the Republican incumbent judge running against a juvenile public defender in the 315th Juvenile Court, said he has not heard complaints about the legal representation low-income kids receive in Harris County. This story was published with the support of the USC Annenberg National Health Fellowship and the Fund for Journalism on Child Well-Being.